Find and follow me on social media. ​purchasing a shirt, booking a presentation, or pledging on Subscribe Star are great too! ​White Shark Video believes the wrong message reaches a larger audience than the right message. We are striving to change this. All too often the knowledge attained by scientists and field researchers goes unread, unnoticed, or ignored by the powers that be. Unfortunately, this leaves “education” on such matters being delivered to the masses in the form of inaccurate, sensationalist journalism and politicians. Using what is currently the fastest growing form of social media, video, White Shark Video strives to deliver knowledge straight from the source. Through a combination of in-person interviews with the researchers and stunning wildlife footage, WSV transforms otherwise hard to digest research papers into entertaining films and presentations. The short films 'Balance', 'Purpose', 'Connection', and 'Swimming in Shark Alley', all produced by White Shark Video, have been accepted and screened at numerous film festivals such as the Blue Ocean Film Festival. ​In 2014, White Shark Video embarked upon the self-funded feature film project, Great White Lies, exposing the sad truth of shark culling. This film has won over 20 awards, limited only by a budget that couldn’t afford to continue film submissions. Download the full film description. Besides ongoing presentations at public schools, founder, Skyler Thomas, has presented his message of coexistence at venues such as the California Academy of Sciences, San Francisco Ocean Film Festival, and Monterey Cetacean Society. 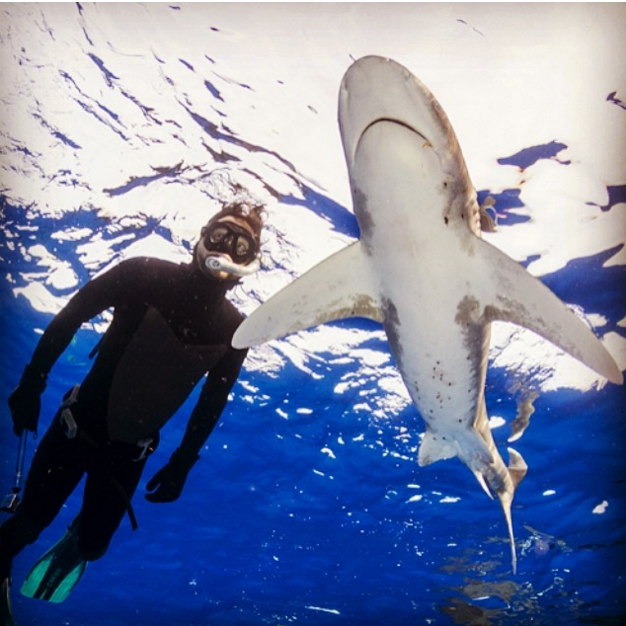 In 2009 Skyler Thomas founded White Shark Video as a nonprofit association and began making short, educational films based on his experiences diving with sharks. In 2013, White Shark Video switched from an association to an incorporated nonprofit in California with a 501(c)3 sponsor. Following the success of a few short films, Skyler embarked upon his first feature-length film, Great White Lies, which exposed the truth of shark mitigation programs across the globe. The film has received over 20 awards in various film-festivals with a follow-up film on its way in 2016. White Shark Video survives on public support, donations, speaking event bookings, and purchases of merchandise ( films, prints, shirts.) We're always looking for motivated individuals to add their talents to the team. If you have a specific skill set you'd like to offer, please don't hesitate to reach out. Skyler Thomas is an award-winning, independent film-maker tackling issues facing the existence of sharks and the growing gap between humans and the rest of the planet. He possesses an MA in Liberal Arts, an MFA in Digital Media, a California Teaching Credential, and is currently pursuing a PhD in Ecopsychology focused on animal behavior. SkylerSharkPromo from White Shark Video on Vimeo.